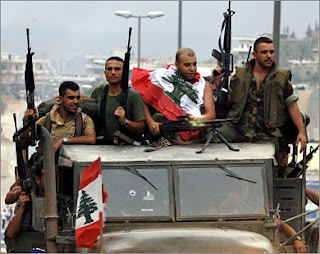 The victorious Lebanese army...did they liberate the south? Liberate Jerusalem? No..they destroyed a refugee camp. i made a video, check it out. the victory of the lebanese army over the thugs is being celebrated as the most wonderful of victories, because it is seen as a victory that has united the lebanese. but at what price? the destruction of nahr el-bared is shock and awe that gives lessons to george bush. some would say that it is un-lebanese to speak about the destruction. it is not anti-lebanese to feel disgusted at the complete destruction of an entire society: nahr el-bared was home to 30 thousand civilians, four generations who have lived there since 1948. this is the second time that they are expelled and their home utterly destroyed, after they were expelled from falasteen. to assume that they deserve this because as palestinians they harbored fateh-el-shaytan is a racist hateful mentality. that is like saying it was ok for israel to compeletely destroy civilian life in south lebanon because they were fighting hizballah, or to say that it was ok for oun and gaegae to destroy christian civilian areas because the civilians were harboring the other side, or to say that it is ok to destroy iraqi neighborhoods in their entirety because alqaeda hides in their midst. to support the civilians of nahr elbared and feel bad for their loss of their home does not mean support for fateh-el-shaytan. think about it this way: who is most elated and joyful today at the complete destruction of nahr elbared? fascists such as hurras-el-arz who openly avow the killing of all palestinians in lebanon. if there are some lebanese who are happy to be like hurras-el-arz, then that reveals a great deal about the psyche of some lebanese.